Rookwood Cemetery is renowned for being the largest cemetery in Australia. It is both historically and culturally significant and is valued as a physical manifestation of the rich social and cultural tapestry that forms our nation today. Rookwood is not only a place of remembrance and peace; it is a place that captures the history and the very essence of our many diverse cultures. HIDDEN – A Rookwood Sculpture Walk was developed to demonstrate to the community that there is more to Rookwood than just funerals and memorials. HIDDEN is an onsite sculpture project that steps outside the notion of mainstream galleries and typical outdoor sculpture exhibitions to showcase Rookwood as Australia’s most multicultural site. The HIDDEN exhibition invites artists to ponder the notion of mortality and its related themes, including love, death, loss and memory. Audiences witness creative expression in a meaningful, yet avant-garde context, with the exhibition promoting the work of emerging and established Sydney artists as they endeavour to respond to and engage with the Rookwood site. 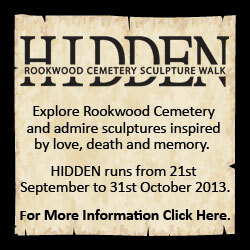 HIDDEN – A Rookwood Sculpture Walk opens on Saturday 21 September and runs until 31 October 2013.